In the fallout from the release of the City Centre Future Access Study last Thursday and the government’s rather bizarre response to it, for some reason there seems to have been renewed discussion about the Additional Waitemata Harbour Crossing (AWHC) project. It’s a bit odd to think that if Central Government has concerns about contributing to a $2.4 billion project they’d end up looking more kindly on a $5 billion project instead, but I guess as it’s a road rather than a railway line you really never know. The same is obviously also true in reverse. Oh an by the way I wouldn’t get too excited about the rail tunnel shown above – the fact that a shuttle line from Gaunt Street to Akoranga is shown, with no connections to the existing or proposed rail network at the city end, just illustrates that it’s only in there as a token gesture. It’s a bit confusing at first, but once you ignore the local roads it starts to make a little more sense. We can see that southbound in the morning peak there would be three lanes in the new tunnel and four lanes (one of which is a bus lane by the look of it) coming over the harbour bridge. The new tunnel effectively removes ‘through traffic’ from the Harbour Bridge, but doesn’t actually add any capacity over what already exists for that through traffic. There’s still only two lanes which continue right through for southbound traffic. There are only three lanes (compared to the current four) for traffic heading to either SH1 southbound or the SH16 exits. What the new road does do, of course, is free up huge amounts of new roadspace for vehicles travelling from the North Shore to the CBD. There are now four southbound lanes over the harbour bridge worth of capacity – all of which can only link to Shelly Beach Road, Fanshawe Street or Cook Street. That’s potentially an absolute flood of additional vehicles that could be funneled into central Auckland because they no longer need to ‘compete’ with the through traffic for roadspace over the Harbour Bridge. The main challenge for this assessment relates to the provision of additional capacity across the harbour and the potential flow on effects this may have on the local road network around central Auckland and feeder roads on the North Shore, particularly in the weekday morning peak. In particular it is noted that the new harbour crossing will allow more traffic to enter the CBD. This conflicts with various CBD strategies that encourage the provision of public transport for trips to/from the CBD and not to provide additional capacity for cars. It fundamentally conflicts with the concept of a liveable city centre. Five general traffic lanes in total, assumed to operate with three southbound and two northbound lanes in the weekday morning peak, with the reverse in the evening peak. This scenario would provide three southbound lanes for general in the weekday morning peak plus additional capacity, equivalent to around half a lane, for general traffic heading to the Shelly Beach off ramp. This scenario also provides the opportunity for a significant increase in the rate of flow from Esmonde Road (and Akoranga Drive) onto the Northern Motorway, thereby increasing the rate of flow able to cross the Harbour and reaching the Auckland CBD. It’s hard to know whether to laugh or cry about the fact that even after spending $5 billion NZTA still can’t bring itself to providing a proper dedicated southbound bus lane. The important thing to note from the above paragraphs though is at the very end: the real impact of the project is a massive increase in flows from the North Shore into the CBD. As no additional capacity is provided south of the CBD the are few gains there aside from being able to hit the gridlock through spaghetti junction a bit quicker because vehicles travelling through the tunnel no longer need to compete for roadspace with those heading for the CBD. A range of options could be used to limit the rate of flow able to cross the Harbour, including changes in the lane allocation. However, for the purposes of this assessment it has been agreed that the effects of the additional crossing will be assumed to be restricted by some means and that this should be reflected by modelling ramp signals on the important Esmonde Road southbound on ramp. Capacity constraints are already predicted to exist on the approaches to or on the other on ramps during the morning peak, and providing ramp signals at Esmonde Road will therefore further constrain the rate of flow able to pass across the harbour and into the Auckland CBD. So we’ll spend $5 billion on adding a huge amount of capacity across the Waitemata Harbour but we’ll still need to use things like ramp signals to limit the flow of vehicles onto the motorway – doesn’t that kind of defeat the purpose of the whole project? The impact of the project on some city streets is pretty massive in terms of additional vehicles – especially Fanshawe Street and Cook Street (Curran Street and Shelly Beach Road, two residential streets, get slammed as well): To cut what is becoming a pretty long story short, it really does seem as though the AWHC project involves spending $5 billion to make it easier to drive your car into the city centre – something we actually don’t want you to do. In other words, it is building the most expensive transport project ever to create more congested inner city streets and a less liveable city centre. It’s a huge amount of money on something that will make Auckland a far far worse city. For that reason, it is quite simply the stupidest transport project ever. If we ar going to build a new crossing it should be something much more dramatic / transformative IMHO like a connection between half moon bay and north head. This would obviously mean back filling some connection points to both of those but at least would create a genuine alternative route that would actually split the flows early that aren’t going through the CBD. This would also allow any rail / bus corridor to the north shore to be evaluated on its respective merits without being a roading project. And thereby destroy Devonport by ramming a motorway through it? It would certainly be transformative. I assume he means boring through past Mount Victoria then cut and covering under lake road up to taka, probably connecting to a grade separated Esmonde Road. On the other side I would bore through to Bucklands Beach road where I would cut and cover through to a grade seperated Pakuranga Road and SE Highway, connected via the proposed Revees Road flyover. Grafton Gully to Takapuna would be more realistic, but even Grafton Gully to Northcote Point is too expensive, so I’m afraid nothing like this is ever going to happen. 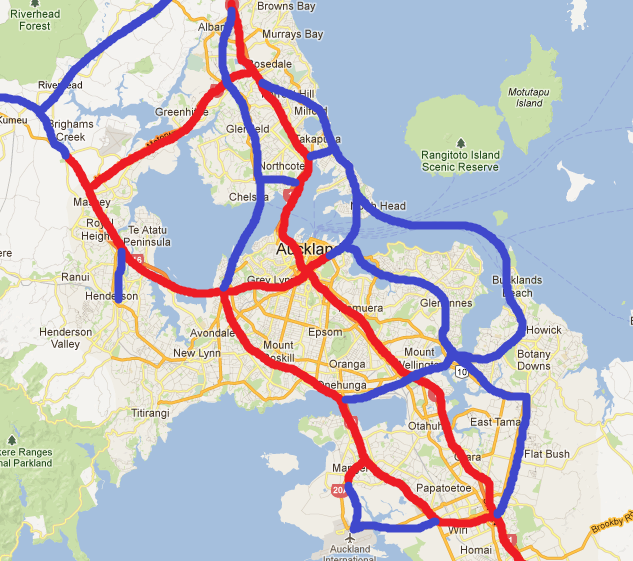 I was thinking about this further last night and started to realise that the whole SH1 motorway network for Auckland has now been optimised for the Harbour Bridge in its current formation. You go and add a pile of capacity across the harbour and either it just feeds the CBD like this proposal or you need to basically duplicate all of SH1 from Albany to Manukau to avoid creating new bottlenecks. Which I thought was the point of the western ring route. To avoid having to build this dumb project by creating an alternative route to SH1. Maybe Waterview to Albany? 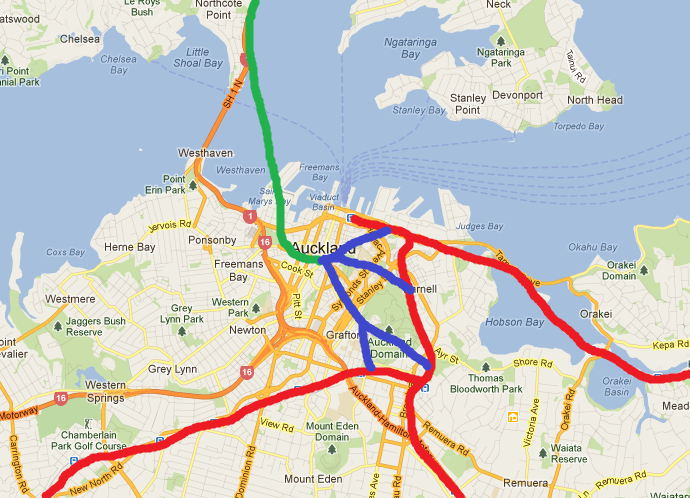 I’m trying to think how a western alignment can avoid SH16 (another congested piece of road). 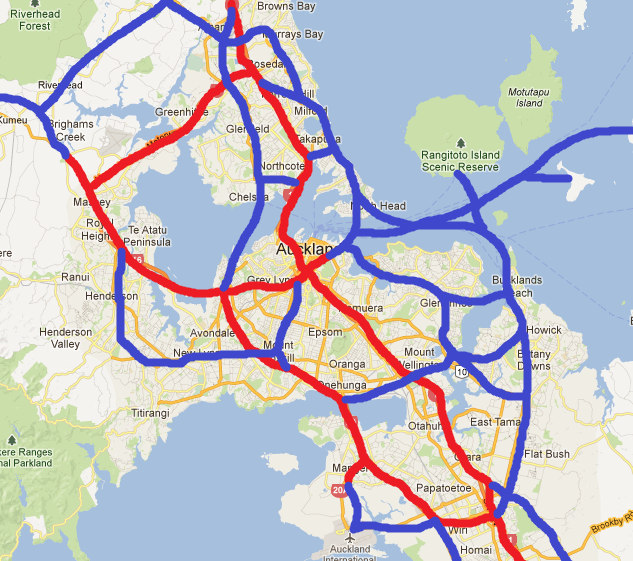 Auckland’s Motorway Network year 2100? I know. Imagine how much it would cost to do this project properly. You can’t widen the middle without widening the outsides. As Patrick says, its insane. The only ones I can realistically see happening is extension of SH16 past Kumeu, full motorway through the airport and the east west link (not that I agree with it). The rest would be prohibitively expensive. FYI just clarifying that my map is a joke. By the year 2150 we would be lucky to have half of that. New motorways are very useful pieces of infrastructure, just perhaps not quite worth their costs. Especially if the cost is the opportunity cost of a higher capacity, less place-ruining and more CBD-based rapid transit system. Not sure if you’ve seen the 1950’s map but is very similar! However I would add two extra Southern Motorways for true exurban horror. One from the 50’s plan heads south from Wiri down Roscommon Road, then jumps over to Karaka. Another one would be to build the Mill Road Corridor as a a motorway to south of Drury, and one that shoots across to Clevedon from Flat Bush. In all seriousness this is what would be done in Auckland if we were to follow the patterns of the last 50 years for the next 50. 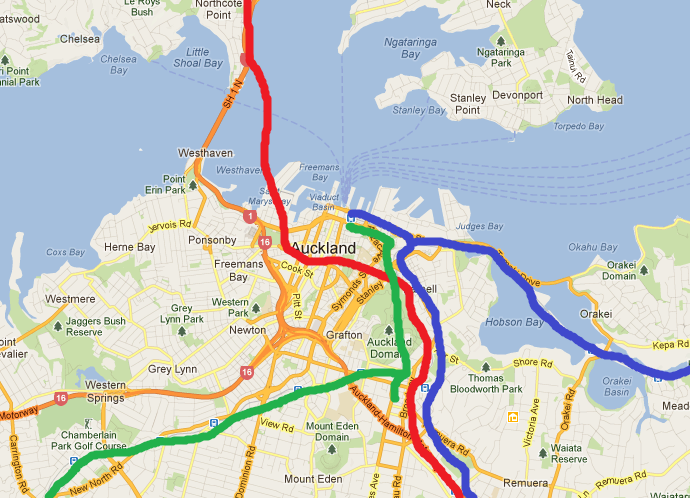 @ Hamish – you’re missing the 10 lane bridge to Waiheke and the Dominion Road motorway mate. Updated version with your suggestions and some of my own! Even putting aside the issues it creates on the southern side of the harbour there is also the massive issue of cost. $5b is simply too big to be paid for out of the NLTF which means we are likely to need other funding options for it. However tolls would not just be needed on the new crossing but also on the existing one to stop people using the bridge as a free route and rat running through the western CBD to avoid paying. I can’t see that being a popular option with those from the Shore. The other thing is that this project typically only looks at the costs for this stage rather than any other impacts. There would also need to be some serious widening of the motorway north of Esmonde Rd to cope with the increased traffic flowing from both the bridge and the tunnel but that isn’t included in this project. By comparison the CRL includes all of the other pieces of work needed to ensure the network as a whole will work including costs for more grade separation, extra trains, duplication of some bits of track. Why is this the number three project on yhe Auckland Plan? Probably because people from the Shore in particular blindly call for it without understanding the costs or impacts. Yes, my family on the North Shore don’t understand the implications of the cost, they just say “get on and do it” and are a little aghast when I tell them that would involve tolling both the new and old crossings all the time. They also think it will permanently fix congestion, especially on trips past the central city, but as Mr Anderson shows it will actually do basically nothing in that regard. So there are two issues there, they think it will be both affordable and effective, when it would be neither. I expect the AWHC is still on the Auckland Plan due to realpolitik. I don’t doubt that AT understand the redundancy of this project, but is likely the Council (read Len Brown) do not want to pick a fight over this with NTZA, North Shore consituencies, and the Government. It may distract from other pressing transport matters, and it seemed like the council wanted buy-in and consensus on the Auckland Plan from as many stakeholders as possible. Thus idiotic and unnecessary projects were retained. I imagine the Council believes/hopes it can play the long game on this. Right, but Len should be talking up rail to the North Shore IMHO. Especially since he campaigned on it. Exactly – I am mystified as to why the “CRL required first if we ever want to build rail to the airport or North Shore” line isn’t a core part of Len’s vocabulary. Because it’s not true. The north shore line may not even be built in a compatible system to our current lines. Even if built as heavy rail it could easily be built first. One service pattern could look like this if it was connected through to Britomart, Post CRL it could then look like this. I appreciate what you are saying Hamish, but I was trying to construct a soundbite! So Hamish, the Eastern Line users heading for the CBD, in your plan, get dropped off at the Strand? Actually Hamish, building a north shore line first wouldn’t address the main problems we are trying to solve so the CRL is still required first. Your suggestion would be feeding all lines through Parnell which means there isn’t really any capacity increase so you still can’t run any extra trains from west or south. That means those trains will still be at capacity during peak times. Further the dicussions for a shore line now involve it integrating in with the Aotea station. Part of the reason for that is to put it through to Britomart would require a junction under the downtown mall site which would pretty much completely kill the chances of any major building being above it and would have to be a flat junction which would severely limit tunnel capacity. In this situation Raffe is correct in that the CRL is required first. In that example yes, but that is just an example. In reality instead of through-routing I would terminate some of the green line services at Britomart and the rest at Akoranga. If it was up to me though a cheaper to build but incomparable technology would be used for the north shore making this discussion redundant. I was not suggesting that the north shore line would act as a replacement for the CRL. I was saying that it could be built first. I would think there would be SOME increase in capacity for other lines however. 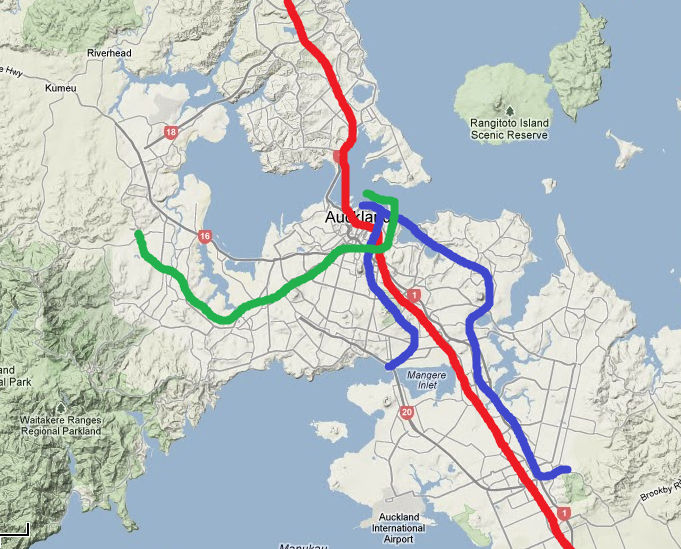 If built first a north shore line could go to Aotea then connect at either the Strand, Parnell or Newmarket like this. Using the Parnell option here’s one example of a service pattern pre CRL. And here’s a close up of the city using that service pattern. If you built the Takapuna spur you could also send Onehunga trains up there and just terminate the western and eastern at Britomart. I see what you are suggesting, Hamish. Every train that goes to the North Shore is a train that doesn’t go to Britomart. So, spend a bit of money say, doubling the Onehunga line and you could send 6 tph from Onehunga to the shore and at the same time free up two exisintg Onehunga paths into Britomart to make room for two additional Western Line services bringing them to 6tph. There is the flat junction at Parnel to worry about, and Newmarket, both of which would then see 15 tph each way, so there may be better choices for selecting the North Shore trains, but I understand the principle. This is a powerful core RTN Network to the more widespread Bus and Ferry connectors and a fantastic complement to the all but complete motorway network. Done. I’m not too happy with that network. The yellows line is providing unnecessary ammounts of capacity south of Panmure, and not having the red line through routed is annoying. Here and here’s what I would do. 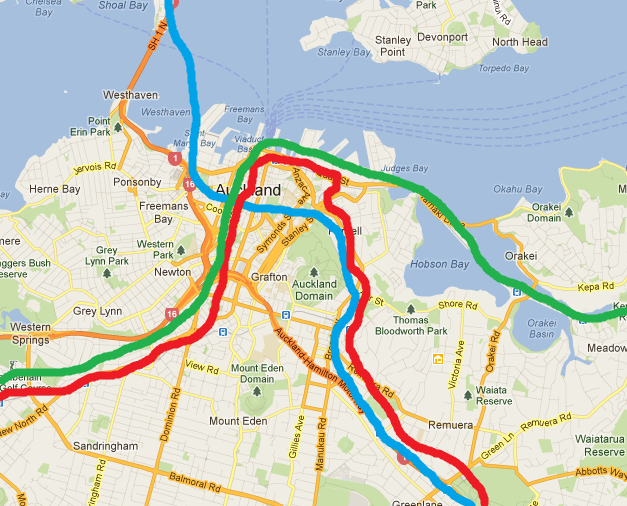 Asides from extending the Onehunga line (cheaply) to Manukau I have gotten rid of most of the Yellow line and connected the western part to the Red line via the Strand. You will notice that there are no sections in my network with 3 lines, meaning that each line could have a higher frequency. This would make up for the removal of the Yellow line of the NIMT. What I like about it is that now the outer western and southern lines have the same frequencies, where as in your version the south was highly favoured. I think a Mt Roskill to Panmure line makes sense adding capacity across the inner part of the network. Use that plus the basic two line system and you’ve got something that works well prior to North Shore rail. After North Shore rail is gets complex again, although less so if that’s a completely independent network (i.e. light metro). Well I’m not going to fight to the last for that service pattern, and sure, by all means take the Airport Line to Manukau. Hell just throw in the Avondale-Onehunga too then…. I still think the map above shows a solid, affordable mid-term goal to be getting on with. But I would point out a few problems with your sugestion: You’ve clearly decided that those school, uni [new campus + Med school], and hospital workers and visitors no longer need serving at Grafton despite the line and station already being there. What you call wasteful on the Southern I’d call high frequency [and I make no predictions about frequency as this is all post 2020 so who knows what other factors will come into play by then] remember I have one line terminating at Papakura and the other at Pukekohe, quite a difference in length. 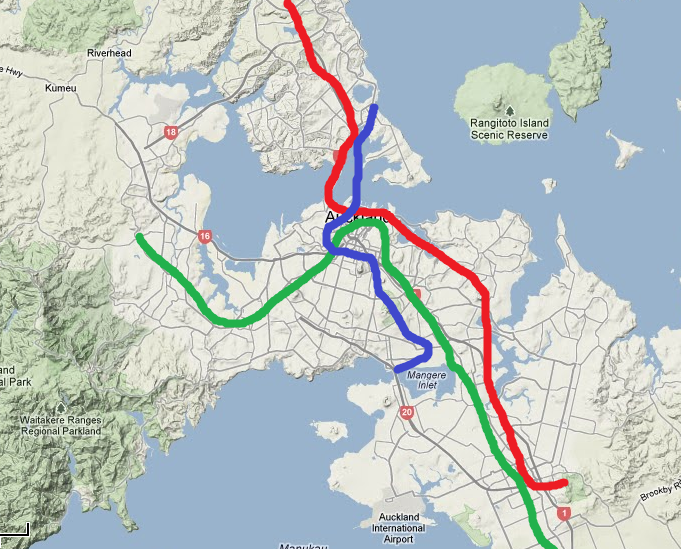 Also that Red line could go round to Panmure or GI if there’s demand… although I suspect people would prefer to change to Yellow or Green earlier if their destination was on the Eastern…. Yeah Grafton needs to be served and the inner eastern needs higher frequency so I don’t think I’ve got it right either. By wasteful I really meant inconsistent considering New Lynn and Henderson only got one line. Yes well it’ll never be a pure ‘metro’ system, there’ll always be double ups. You’d just increase the freq on the Western. Double ups are not necessarily a bad thing – they give opportunities to be creative. if you went for a pattern of inners and outers, then you could make use of what would otherwise have been double ups to improve journey times further out. For instance, using Hamish’s pattern, if each of his lines represents a 6tph peak pattern, the green line could be fast from the CRL to (say) New Lynn or wherever the Avondale line diverged, either the green or the red could skip some stops between Westield and Wiri, Either blue or red could run fast between Newmarket and Penrose, and if a fourth service were added: 6thp all stops – Newmarket, Grafton, CRL, GI, Otahuhu, the green line could be fast between Britomart and Otahuhu, and Grafton would be served . There is then a pattern of 6 tph at every station, and 18 tph though the core CRL. You might argue that the fouth service is a waste of resource, but using inners and outers allows you to better target train lengthening, and such a pattern may turn out to actually be more efficient than a simple metro. We need double ups on the inner parts of the network to get capacity where it needs to be. Richard, I’m not sure how feasible a mix of all stops and express would be. With only two tracks on each line your fast train would save about three minutes before getting stuck behind the all stops train in front. Better to just run them all at all stops for regular consistent service. Yes looking at the map above if there is say 6tph on each line ( except the blue line which would be much higher 10 or 12) then there’d be 18 tph on the CRL and the spine of the southern. 12 at Mt Albert, Mankau, and Papakura, but only 6 at Hendo and Pukekohe. Nick, as a previous debate discussed, the journey time vs car is not good for abstracting people out of their cars once you get a reasonable distance out of the centre. I’d argue that moving from an all stops 10 minute frequency to an all stops 5 minute frequency is a waste of the additional resource (you make no difference to anyone’s journey time and you improve everyone’s generalised journey time by 2½ minutes). Alternatively you use the extra trains to run fast in the gaps between the existing all-stops service. Between each point where you can overtake, a fast service can improve the journey time by 6 minutes. (Start two minutes ahead of the second stopper, catch up to be 2 minutes behind the first stopper, on a ten minute cycle.) 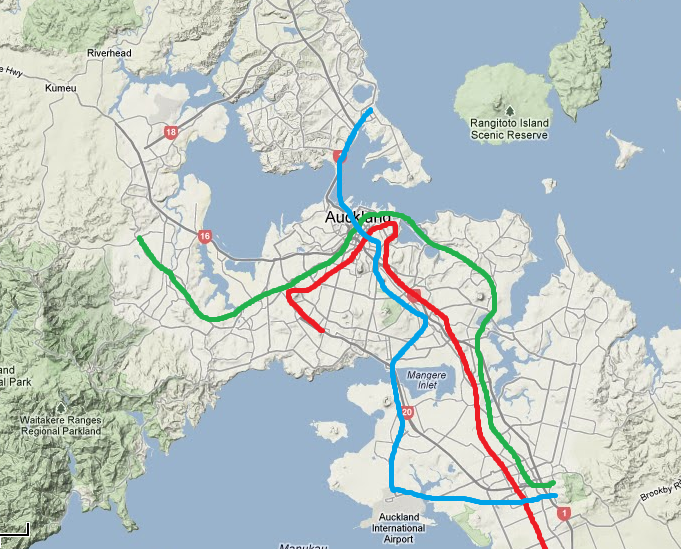 If you can manage a catch-up a second time because the caught up stopper diverges – to Onehunga, Manukau or terminates at (say) New Lynn or Otahuhu – you might improve journey time be a second segment of 6 minutes giving an overall improvement of maybe 10 minutes to Henderson and Manurewa/Papakura. That’s a 20 minute saving on a round trip – as well as improved journey times for those beyond the service’s last stop before the centre, that’s a rolling stock and crew diagram saved. It is clear that this project would be a complete disaster for both the central city and the Shore road networks. So you have to ask; what on earth is it for? Is this being pushed by NZTA Auckland just so they can all have one more big fat motorway job to move to after Waterview? Ok let me get this straight, five billion dollars to move through traffic from the bridge to a tunnel, so that the whole bridge can be used to dump more traffic on to Fanshawe St and into Ponsonby… which they expect to have to go back and limit with ramp signals anyway. All I can say is OMGWTF! Does the costing include widening the Northern Motorway and it’s approach roads? Does it include somehow widening Fanshawe St and the other city arterials? Does it include three or four new multistory carparks downtown? If not I can’t see how it would work, even if we were happy about the idea of doubling weekday commuter traffic from the Shore to dowtown. Really, if they are so concerned about increasing peak commuter capacity to the CBD, shouldn’t they start with something as simple and cheap as continuous bus lanes for the busway? Let’s factor that through. Three new lanes of traffic to the CBD, at 2,000vph each, so around 7,000 people an hour (if they somehow work out how to move that traffic once it leave the bridge). That’s about the same as what our $300 million incomplete busway carries. I wonder what the efffect of the crossing would be then, would it simply move those city commuters out of the buses and back into cars? I wonder how the folks of the North Shore would feel about having both the new and old crossing tolled all the time simply so the same bunch of city commuters were in cars instead of buses? Hey, only the City Rail Link has to include each and every related or possibly related project cost in its BCR calculations. Motorways are allowed to be looked at in splendid isolation! What a disaster for the city as a whole. Council should respond by announcing road diets and exclusive busways for the worst affected streets 😉 After all, Brownlee is all about buses instead of trains. Yes indeed, so where exactly are +16,000 cars per day onto Cook St supposed to go?! Along which roads, to what car parks? Where exactly do we stick those extra 10,000 parking spaces? NZTA will dig a giant 16,000-space carpark under Albert Street from Wellesley to Customs, at a cost of $1.2 billion. It will sit above the CRL tunnel, so the price will be included in the budget for that, and used as further evidence that the CRL is too expensive. Don’t give the bastards ideas! Cook Street is an exit we should be looking to close not massively expand. Here’s the thing; we could build nothing but car parking buildings in the CBD and we could turn the street in the middle of the University into a non-stop bus sewer, but why on earth would we want to? We will certainly be poorer as a result. Just to satisfy the extremely autistic accountancy of the National Party? This idea that the NLTF is filled with taxes from road users so therefore we must destroy our biggest and fastest growing centre of economic activity because this money must only be spent on roads is extraordinarily daft. I know they don’t understand what a city is. I know they suffer from total capture by the trucking and road building lobby. But really this is now too silly. And if the people at the top of NZTA and MoT can’t see this then they really are operating way above their pay scales. Yeah even I am perplexed by The Party here. Fletchers and even Fulton Hogan would be rubbing their hands with absolute glee if they tendered for the CRL project so I wonder why (if they are not) pushing Government for this mega-project to get going. Hell even Mainzel(?) would be rubbing their hands too if they got in on the act and were “front in line” for the urban redevelopment contracts around the three stations which would be kicked off from the project. The CRL would give one heck of a boost in the jobs field too and probably give a boost in confidence in the wider economy because we have at a wild guess 1500 jobs (direct or indirect) created and probably quite happy spending their pay packets where ever causing a flow on effect all due to the CRL and other projects from it. Throw in the Airport Line to boot so that it is up and operating by the time the CRL is fully open and the multipliers just keep on rolling. So do I need to rewrite that TO THE NATIONAL GOVERNMENT letter again and this time send it to every single National MP?! Fletcher are the only NZ company with enough experience to be the lead contractor on a project like this. Probably will be like Waterview where Fletchers are up against Leightons (lead contractor), with Fulton Hogan as the NZ contractor handling the ‘roadworks’. Unless of course we get into the Chinese PPP’s to get cheap deal…. Building a new harbour crossing would be useless because it would provide more capacity for the crossing and then cause huge congestion on SH1 at either end. Stupidest ever? Have a look at Sydney. I especially liked the recently announced plans to pedestrianise part of George St. They think there are too many buses coming into the CBD, so their solution is to reduce the number of streets they can access? In general they still have the same attitude as the NZ central government of expanding the road network to address congestion. Damn it Sacha you beat me to it! Surely though with the shear number of new RONs blackholes proposed in Hamish’s graphic I tender he and Borwnlee would reach such heights of auto arousal/tarmac titillation they’d simultaneously and explosively void their bowels and balls. Both Sacha and Luke. – I do not want those images in my head. Yes, but that is only one in a long series. That light-rail plan looks excellent! Might do a post on that in the next few days to highlight that non-insane centre-right governments see the value in rail. Well Mr A, you could add Houston [yes the big oil city in Texas] and any number of other unlikely sprawl burgs like places like LA and even Phoenix that are putting them in too. Despite all the crazy Republican shenanigans that goes on to stop them. – What is that amber squiggly line connecting Sussex St and Parramatta Rd? One would have thought that would be explained. Southbound buses from Sussex St may need to cross the trams twice if the current road network remains. – Then there is the forecast travel time which is significantly slower than the existing buses. Won’t this be a deterrent to using PT? – It’s not clear that buses using Eddy Ave to access Elizabeth St won’t impeded the trams, and vice versa. – What is the proportion accessing Sussex St and Elizabeth St? – How come bus numbers approaching the CBD on Parramatta Rd, Victoria Rd and William St are reducing? – If Albion St and Foveaux St are to no longer have buses, 339, 374, 376, 391 can no longer reach Central. Will these people now need to pay two fares or a MyMulti to get there? You’d think that they could remove taxis from parts of the George St bus lane before thinking to remove the buses. I’m so glad this post has veered from the utter stupidity of any AWHC to light rail. Would bringing a Righty from NSW over to explain to the Righty’s in Wellington how to “Do the right thing” help at all? Anyone could not seriously seriously propose this project with a straight face. It is just too crazy. – rail in the city is expensive, unreliable and of limited use (indeed of no use to North Shore people because we don’t have rail). I would guess that very few people here have ever caught a train in Auckland (I have – once) and so their experience of Auckland Rail is what they see on the media. No doubt the World Cup debacle cemented the impression that trains could not be relied upon as a transport option. – many North Shore residents have had big rates increases with the new super city and there have been a number of stories about long standing events no longer getting council funding. There is a perception that. the North Shore is is “bled” to pay for projects elsewhere. The Rail Link (since we don’t have rail) is very much seen in this light. – there is a lot of fear of intensification, and considering how poorly it has been done in the past, with some justification. I believe there are many North Sore apartment owners who have been stuck with expensive building issues..